LONG POINT – Our turtle friends haven’t disappeared, they’re just moving a little slower these days. 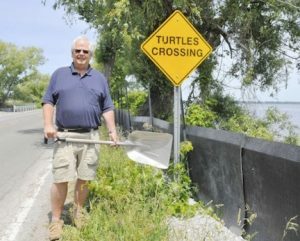 Members of the Long Point Causeway Improvement Project (LPCIP) have long advertised the need for motorists to slow down and watch for turtles crossing Norfolk County roads in search of nesting sites. That message is generally delivered in the springtime but comes a little later this year. “This is probably the coolest spring we’ve had in a long time and we have not seen very much activity on the causeway,” noted Rick Levick, a coordinator with the Causeway Improvement Project. Abnormally high water levels have also kept turtles from nesting. According to LPCIP numbers, mortality rates on the causeway have decreased significantly in recent years. The 53 reptiles killed in 2015 was the lowest amount ever recorded and is a stark contrast to the 248 deaths seen in 2008 when the LPCIP began its campaign. Much of that success can be derived from both culverts and fencing being erected at high-traffic areas in Long Point. “The other part of this is basically people changing their attitudes and taking the time to watch for the animals on the road and in some cases help them across the road,” Levick noted. Depending on the species, female turtles can lay up to 12 eggs per year. Studies show the older the turtle the more likely their eggs are to hatch. The unfortunate fact is some never get the opportunity to reproduce due to motorists. Though Levick and the LPCIP have Long Point in mind, they want to make sure motorists driving near all wetlands are keeping an eye out.